Sometimes, the energy expended complaining, could be used more positively by trying to figure out why things aren’t panning out. If whining were so effective, we’d all be successful. You think? Whether we’re writing, acting, singing, playing golf or doing our day-to-day activities, we should give it our all, and expect that the fruits of our labor will grow. There is no magical wand or free ride. And it may sound cliché, but the truth is, there’s only guts, sweat and tears. And at the end, success. I look at it this way, if everything came easily to me, I’d be bored stiff. 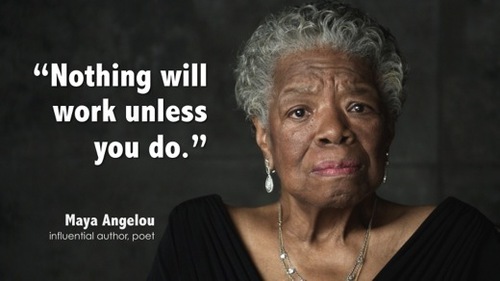 Thank you, Maya Angelou for the constant reminder, to steer clear of the cliff. This entry was posted in Life, Soapbox, Thoughts, Writing and tagged creativity, lessons, life, magical wand, success, Writing. Thanks so much for stopping by and reblogging!